You read that title right. This is a game where plants are pitted against their eternal mortal enemy. No, it’s not slugs or greenfly – it’s Zombies. Don’t go thinking for a second that when the Zombie apocalypse strikes that the undead will ignore mother natures children. The zombies will chomp through as much grass and petals as they need to in order to reach your delicious juicy brains. However your plants love you. You water them, you weed them and you talk to them. It helps them grow. Therefore your plants have no problem taking up arms against the Zombie invasion and ensuring you survive without a single scratch on your cranium. This is the premise of Plants vs. Zombies. I shouldn’t have to convince anymore to get this game in your life but I will because I love this gem and it just gets better and better. 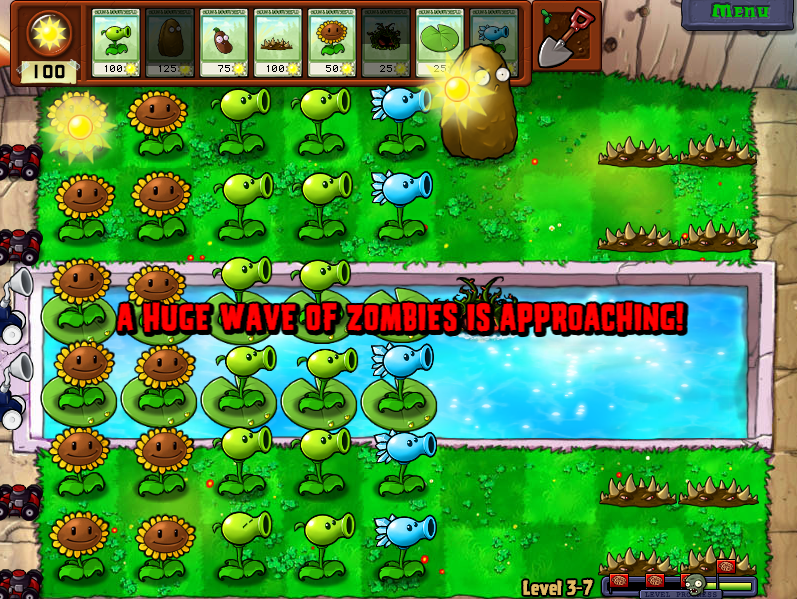 Plants vs Zombies is a tower defense game. This usually means there are waves of enemies trying to invade your base, it is your job to place defenses along your enemy’s path that blow them up, ensuring your base is safe. 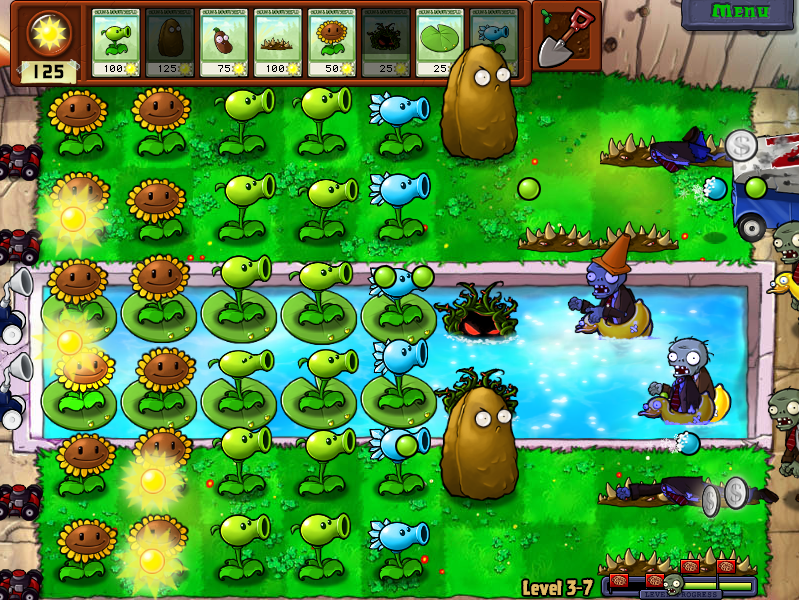 PvZ simplifies this a bit by placing your base (your house) on the left of the screen and has your enemies (the zombies) enter from the right along one of 6 lane ways. You spend your time planting various plants which range from pea shooters to cherry bombs along the lanes. A simple mechanic becomes easy to pick up, difficult to put down and also filled with a plethora of different strategies for defeating the walking dead. Like most games by PopCap, PvZ will have you playing into the wee hours of the morning and I promise it will be an enjoyable ride. The game is not repetitive but intuitive and fun it has a sense of humour that will have you giggling while you dispatch your creeping foes with solar powered justice. The game is available for PC and Mac, as well as iPhone OS. I highly recommend it, the awesome geek loves a bit of tower defense and zombies any day of the week and Plants vs. Zombies is definitely one of the best of both out there. This entry was posted in Video Game and tagged iPhone, Mac, PC, Plants vs. Zombies, Popcap, Tower Defense, Zombies by Jonathan Day. Bookmark the permalink.